One of the more reliably fun parts of my job is the occasional food photoshoot, and whenever Harry has something new on the menu, he's excited to have me come take pictures and let him know what I think. Today, though, I had a spectator... a random staff member who watched me taking pictures and wondered what I was up to. I explained that I do take pictures of a lot of what I eat, partly out of habit, but this time it was because we needed pictures for Cornell Dining to promote the new stuff! The burger was great! I don't really love the greasy bread of a burger melt, and would usually prefer a roll, but this was really, really tasty. They're sautéing the mushrooms in a little butter, and the sauce on top is a dijon honey mustard. I'll definitely go back for this one next month. My spectator commented that his eight-year-old son recently pointed out how different the food you get to eat looks from the picture of it in the ad, or on the menu. Pretty observant little kid! Fast food, in particular, can be tough to photograph and make it look good. The stuff in the ads is not coming out of one of the real fast food kitchens, but even those I can sometimes make look all right. This Wendy's double is a good example. 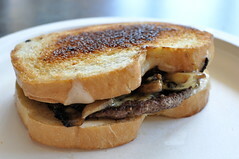 It's not "pretty," but it looks good enough to make me want to eat a burger. In this case, the remarkable light around sunset played a really big role. I used sunlight in today's shoot, too, since pretty much everything looks better that way than with a flash, but you don't always get to choose. 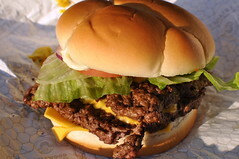 A Wendy's burger usually looks a lot more like this. I don't know if this is true or not, but I heard once that ( I think it was ) Campbell's that was caught putting marbles in the bowls of soup - this was so that the vegetables and other stuff would sit up high enough to show up in a picture .... but the complaint was that those marbles made the soup look like it had a LOT more stuff in it than it did. Do you still get your fries with no salt?